Rodina Cave Parnall is coming full circle by joining the American Indian Law Center, Inc. (AILC) as Assistant Director of the Pre-Law Summer Institute for American Indians & Alaska Natives (PLSI). Cave Parnall attended the intensive 8-week PLSI program in 1998, tutored in 1999, taught the Indian Law course in 2011 and 2016, and has been involved in the new PLSI Judicial Clerkship Program. She is Quechua (Peruvian Indian). Cave Parnall recently returned to New Mexico from Washington, D.C. where she served, by Presidential appointment, as Senior Policy Advisor to the Assistant Secretary Indian Affairs. Before that, she practiced law in New Mexico and Arizona, primarily representing tribes and tribal entities. 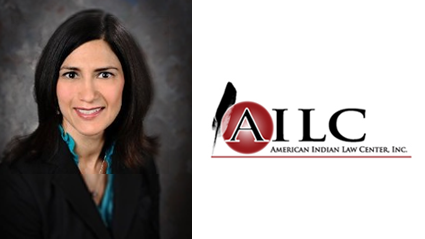 In addition to her Indian law practice, she is experienced in complex federal and state litigation and appeals. Cave Parnall is an adjunct professor at the UNM School of Law, received the 2014 New Mexico State Bar Indian Law Section Outstanding Achievement Award, and is an Associate Judge on the Southwest Intertribal Court of Appeals (SWITCA). She graduated in 2001 from the ASU College of Law with a Certificate in Indian Law and the Outstanding Law Graduate Award. She holds a B.B.A. and M.Ed. from the University of Massachusetts Amherst. She clerked for the Honorable William C. Canby, Jr. with the U.S. Court of Appeals for the Ninth Circuit.